Because of the distinctive aroma and flavour, coriander plant is commonly used as a spice in many famous dishes, it is simply unavoidable in cooking around the world, and the essential oil of coriander protects the body from bacteria, revitalizes it and returns the natural balance, thanks to its special content. In its structure, this herb contains a lot of vitamin C, proteins and organic acids, while the oil contains around seventy percent of linalool, borneol, pineola, geraniol and limonene. 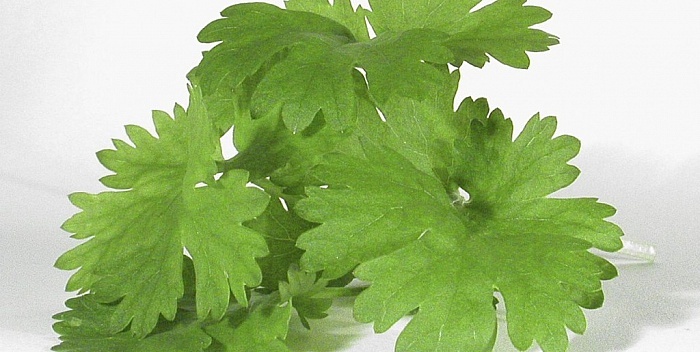 What are the ways we can use coriander as a medicine, find out below. Coriander plant is one of the oldest medicinal spices, whose beneficial properties were known by the Egyptians and Assyrians - these ancient people used the Coriandrum sativum in funerals and magic rituals, but not only there, but also for medicinal and culinary purposes. It is a herbaceous plant with tiny white flowers and aromatic fruits, which grows in height from thirty to ninety centimetres. All parts of this plant are edible - the leaves are mainly used fresh and added to various salads, as they point out the taste of each ingredient separately. The fruits of these plants have a pleasant smell, like a mixture of sage and lemon. They are used as a seasoning for soups, sauces, toppings, as well as for the production of essential oils in aromatherapy. In addition, if the coriander spice is consumed daily, it will positively affect overall health. To conserve valuable properties as long as possible, it is necessary to wash coriander plant, and to drain it, and then dry it out with paper towel. After that it should be disposed of in an airtight box or airtight container and stored in a cool place or in the refrigerator. One of the great benefits that the plant coriander has on our health is that it stimulates lactation which is good for nursing mothers. It is rich in proteins, vitamins A, B1, B2, C, and a number of organic acids. Thanks to its healing properties, coriander plant can alleviate a whole range of health problems. It is very effective in fighting colds and flu, and also it effectively regulates a range of digestive problems - strengthens the stomach, stimulates appetite, eliminates the accumulated gases and prevents bloating of the stomach. The ingredients of the herbs have antibacterial effect, and coriander tea can help in cases of problems with diarrhoea and constipation. In addition, coriander works as a powerful antioxidant, diuretic and pacificator that eliminates toxins and heavy metals from the body. Thanks to the fact that it contains iron, it can help people suffering from anaemia. It also helps in the case of problems with rheumatism and arthritis, as it successfully eliminates excess fluids and reduces swelling. Acids contained in it very effectively reduce blood cholesterol levels and prevent their deposition in veins and arteries. Chewing leaves of coriander eliminates bad breath, and aromatic properties make it suitable for making natural deodorants. Also, it can be of great help to women who are breastfeeding, as it encourages the production of milk. Essential oil of coriander obtained from its seeds has a soothing effect on the entire nervous system, because it encourages our mental and intellectual ability – it relieves tension and stress, which people suffer from daily. In addition it can also alleviate menstrual cramps and headaches, and it is often applied as a natural product in aromatherapy. More recent studies indicate that coriander oil can be used in the fight against a whole range of bacteria, particularly against nasty salmonella. The coriander plant has a valuable ingredient gentamicin - which is known to be two times stronger than the most effective antibiotics that are normally used to combat these nasty bacteria. Also, unlike ordinary antibiotics, this element prevents the possibility that the bacteria subsequently develops resistance to its effects. For all these reasons it is well used as a supplement to various dishes, as it will very successfully protect us from potential harmful substances, as well as the entire spectrum of bacteria that enters the body through food. We recommend that you read our article: the best natural antibiotics. Prepare two cups of leaves of coriander, one cup of oil beet, half a small teaspoon of salt and a pinch of pepper. In a separate bowl pour the water, boil it, and then add the coriander and allow it to stand for about 10 seconds. Then take it out and put it in ice water (to prevent it from cooking in its own steam). Remove any excess water from the leaves, and dry them with a paper towel. Put the leaves in a blender, add the oil, salt and pepper and mix well, then pour everything into a closed container and let it stand in the cold. Filter the mixture and refrigerate. Coriander plant can be prepared in the form of medicinal tea for various ailments. One small teaspoon of coriander mix with chopped onions, and pour it all together with a cup of boiling water. Leave it to rest for at least ten minutes, filter well (through the draft), sweeten with natural-homemade honey and drink twice a day. The best to do it is to immediately drink it when you get up or before going to bed. The composition of this tea mixture contains the anise fruit, caraway, dill and coriander. Take a sizable tablespoon of this mixture and pour the boiling water (2 dl) over it. Wait until the tea becomes lukewarm and drink it after eating. If you suffer from inflammation of the bladder and urinary tract, make the following mixture. Take equal quantities of leaves of parsley and coriander mix and take one full tablespoon of the mixture. Pour five decilitres of boiling water and remove it to the side. After fifteen minutes, filter it and drink. Do not sweeten this tea, and try to take it an hour before all main daily meals and be sure to drink it before going to bed. Phytotherapists recommend taking up to two litres a day. Mix a small teaspoon of mint, cumin and coriander and pour it over with two and a half decilitres of boiling water. Remove to the side and leave it fifteen minutes until it slightly cools down. Drink it after eating. Today, the coriander plant can be found in health food stores, herbal and regular pharmacies as well as in the better-equipped supermarkets where they keep medicinal spices. Also, many products are available online.